John Williams conducted the Los Angeles Philharmonic during three weekend concerts at the Hollywood Bowl. It was, as always, hugely entertaining, with the maestro doing considerable Star Wars music and introducing a new suite of music from The BFG. 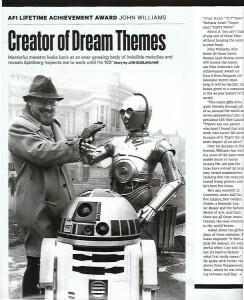 Then in just a few days, he’ll be honored on Turner Classic Movies with a night of his movies plus two terrific American Film Institute specials: a commercial-free version of the Life Achievement Award dinner from earlier this year, and his conversation with Steven Spielberg that first aired in 2011. Here is a look at both events. 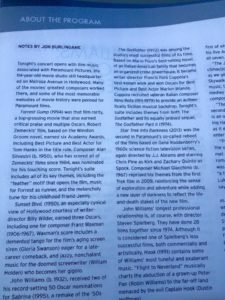 This entry was posted in Composers, Film Music and tagged AFI Life Achievement Award, AFI Master Class, American Film Institute, Film Music Society, Hollywood Bowl, John Williams, Star Wars: The Force Awakens on September 7, 2016 by Jon Burlingame.